As the title of this post implies, I'm going to keep this brief. Got a busy Sunday to get through. And by busy, I mean sorting through an explosion of clothes, otherwise known as my closet. Hope everyone's weekend was fabulous! cute! i love the bright color on you. 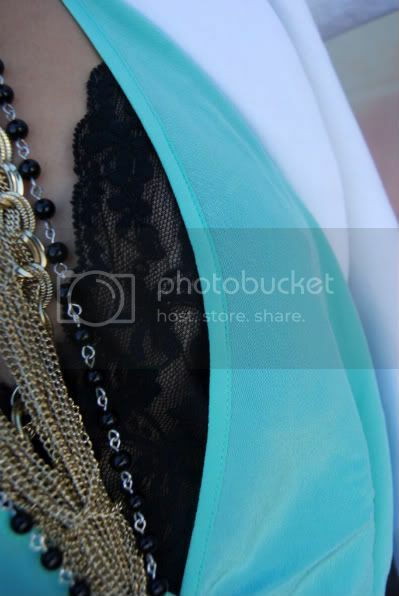 Love the detail shot - the mix of textures and color is perfect. Such a great look! I adore the lacy slip and the belt -- super cute outfit! Oh my gosh I love this dress, the colour is perfect! And loving the way you styled it too. That color looks great against your dark hair! Yay for socks and sandals! And I ADORE the color of that dress! Love the mint green dress, especially with a bit lace underneath. Pretty!! very pretty color combos... i just did the same thing to my closet...got a boatload to go consign now! very cute outfit! i really can't wait to try and rock the sandals with socks look. it makes me a tad bit nervous because i've never done it before! Everything about this outfit is amazing!! Ho visto tutti i tuoi vecchi post...che outfits magnifici! Wow that color looks fabulous on you. I love this outfit! Your style choices are always so fab!